Although Pattaya has a reputation as a night time destination, you also have many things to do in Pattaya in the daytime. The are many Pattaya attractions that we would recommend you visit when your here. It doesn’t matter what you are looking for? Whether its culture, adventure, extreme sports or nature, the vast array of visitor attractions will cater for you. Some are free, some are fairly cheap and others can be expensive. Make sure you buy tickets either at the venue or from a reputable tour operator such as Viator. From time to time you will be approached by taxi drivers and locals offering to take you to various attractions or shows, whilst not all will rip you off a few may. If your looking to fill your days visiting Pattaya attractions then let us showcase some of the options below, we regularly update these pages with new reviews and tips so be sure to check whats new. The Thais are very proud of their culture and rightly so it is such a diverse country. They take great pride is showing you and teaching you about their religion and culture. If your looking for relatively cheap things to do in Pattaya, then the cultural attractions are a great place to start. Many of these are owned by the government on behalf of the Thai people with the aim of showcasing the culture. As such these visitor sites are operated as a sort of a charity and profit isn’t the main priority. Which makes them great value days out in Pattaya. 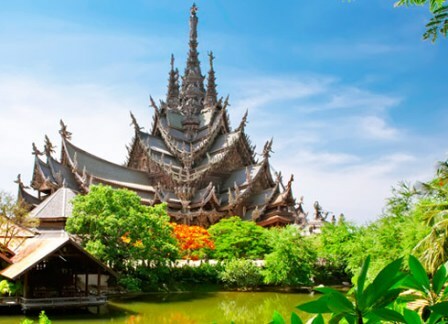 The Sanctuary of truth is one of the best cultural attractions in Pattaya. Located in Naklua, this privately owned and built temple is open every day to thousands of visitors. Entry fee is around 500 baht and this allows you free access to roam the 10 acre grounds and temple. 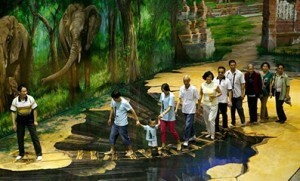 Other options for culture include, Big Buddha hill, Nong Nooch gardens, or one of the many temples. Things to do in Pattaya with your family is a vital decision every vacationing family must make. Finding something that all members of the family will enjoy can be difficult wherever you are not just in Pattaya. There are many attractions suitable for families with children of all ages. If you choose an open air attraction then we recommend visiting either early in morning or late afternoon when the temperature has cooled a little. There is nothing worse than grumpy over heated children. There are also of plenty of indoor air-conditioned activities you could enjoy. We would highly recommend planning your day out in advance, including pre-booking your transport. Also taking along some snacks and water is a must. A lot of attractions will over charge for refreshments as a way of supplementing their profits. Good examples of family orientated attractions are:- Art in Paradise, Crocodile farm, Mini Siam or the Teddy bear museum. When we say shows we don’t mean the sleazy ones this town was once famous for. We mean good honest shows the whole family will enjoy. If your compiling a list of want you want to visit then it should definitely include one the Lady boy shows. The title “Lady boy show” may put off a few, but it really shouldn’t. These are big budget cabaret style shows in purpose built theaters. The shows offer a comical view on Thai culture and a very entertaining. If you visit expecting Broadway standards you will be disappointed. The standard of dance and singing is so bad it’s forms a vital part of the shows charm. There are also a selection of Thai cultural shows which offer an insight into Thai dance and culture. Many of the shows offer 3 showtimes a day. Perfect for families. After the show there will be an opportunity for photos with the cast and sets. Most shows will charge extra for these photos even if you use your own camera. If your a active kind of person then choosing attractions which will suit you couldn’t be easier. There are lots of choices for you. Pattaya is home to several Go Kart tracks, bungee jumping, shooting ranges and water sports. A word of warning we don’t recommend hiring a jet ski from the vendors on the beach this is a well known local scam. Golf lovers will be spoiled for choice when choosing where to play. Many of the golf courses are of tour standards and offer great value for avid golfers. There are many specialist golf tour operators here and we would highly recommend their services if fancy a round. If the thought of all these Pattaya attractions has made you hungry then check out where to eat in Pattaya.